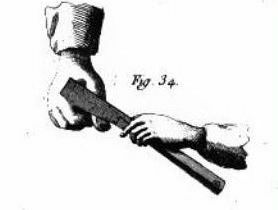 Jean-Jacques Perret was a master cutler in France, he was born in 1730 in Beziers, France, son of a cutler, his adventure with cutlery started at the very young age of 12. 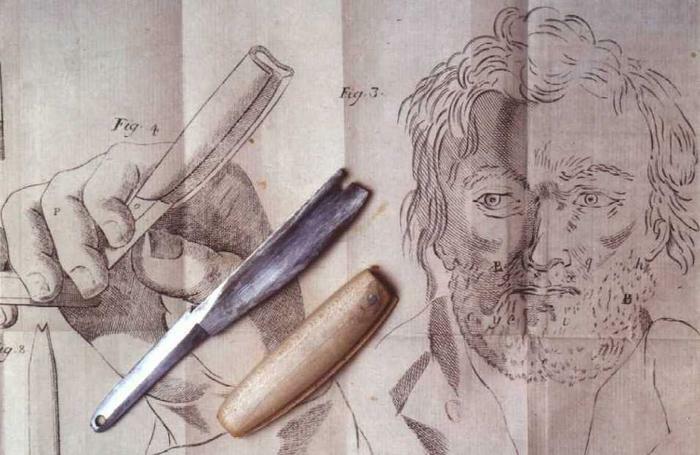 After learning the trade Perret got involved with surgeons and his specialty quickly began towards surgical instruments. Of course razors were a big part of surgical instruments at this in history and Perret was making some. In 1770 he wrote a book "La pogonotomie" or "the art of shaving oneself". 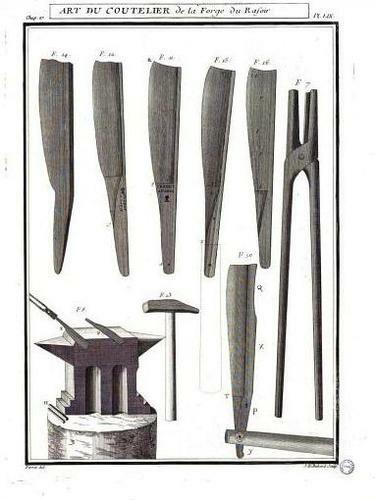 In 1771 he wrote another book "L'Art du Coutelier" or the art of the cutler, this book goes into all phase of cutlery from metal choice to forging,grinding, etc. One chapter of this book is about razors and how to choose the proper metal, cutting, forging, grinding, how to make and cut scales out of horn, wood etc. The most interesting part is the description of making the original bevel or "bevel setting". It is clearly written about choosing the correct stone for this application, and how the stone must be flat, and clean and the use of water or oil. It is also explained about the sharpening stroke that one must use to set the bevel form on the razor, and the proper way to hold the razor while creating the bevel. 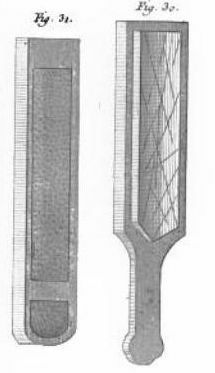 Here the illustration of his razor stroke. And another illustration of the honing stroke. 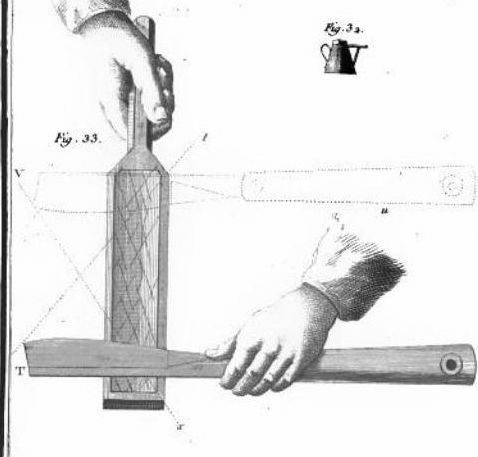 It is said to make many strokes untill the bevel is formed and when you think that each side joined each other, it is now time to test your results using a moist thumb nail and drag the edge on it slowly and it should be smooth and bitting, here the illustration of the thumb nail test method. After a good test, he goes into polishing the bevel mainly on coticules. It was quite interesting to find this method still in uses today in such an old book, ive been told that the honing methods on SRP were based on old barbers manual but never found any that included setting the bevel. 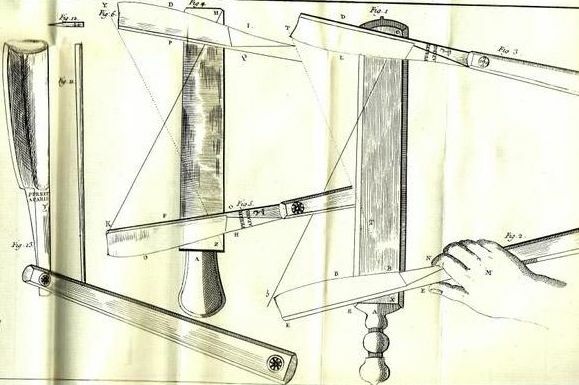 Perret is also recoginze as the father of the safety razor, with a wooden attachement that he added to a razor like the picture below. But i find that a little questionable. The attachement is at the bottom right corner last pic bottom, out of wood that would slide over the razor to only expose a little part of the blade and by the thickness of the wood and resting the wooden part of your face would make the correct angle for shaving. And a pic of his razors. Another pic of Perret safety razor, his idea of it came from a wood plane. Last edited by Martin103; 01-06-2013 at 11:18 PM. superfly, randydance062449, JimmyHAD and 19 others like this. As always Martin thanks for the research material. Funny for 240+ years later, were still striving for the same goals. To find the perfect bevel seting stone. Neil Miller, Martin103 and Villalon88 like this. You continue to amaze me with the stuff you dig up Martin. Kudos! For sure and still using the same way of using and testing like they did is quite amazing! Thank you! It was fun to chase down with Google and enjoy the rest of the book especially the illustrations. 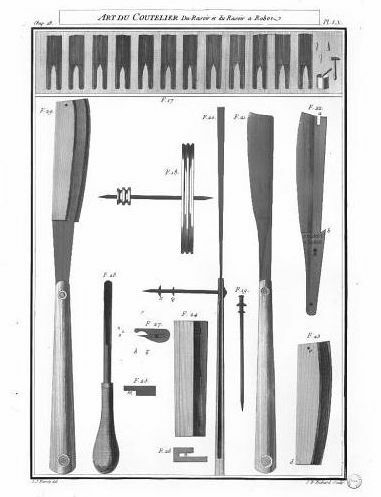 Modern tools are the same shape for a given function as back then. Martin103 and silverloaf like this. Just a guy with free time. Does this mean someone has translated his books to english? I'd love to read them! Don't I wish! some parts were translated by Bernard Levine. Way too long a day for me, can't even get the phrasing right! Last edited by Geezer; 01-07-2013 at 01:41 AM. Reason: Added link! Duh! Thanks Martin, fascinating. That's pretty much where I am now: setting the bevel, test, then polishing the bevel on coticules. Edit: Geezer, maybe it's just been too long a day but I can't find a link in your post. I don't know about all of you, but that razor in the first few pictures is enormous lol. Setting that aside very informative. That looks like an early style barbers notch to be used with the safety cover. Wonder if that is how they started out and became just design to please the eye. Last edited by JSmith1983; 01-07-2013 at 12:12 AM. Actually the little notch is where the wooden safety attachement locks in.